Superball Keno - Play Online - Casino Answers! Superball Keno is one of the classiest games in the online keno industry and it features a neat and clean gameplay. Developed by SED Gaming, it is an 80-number keno board game. Gameplay: The general rules of Superball Keno are pretty standard. You can put up to 10 spot bets and choose any number from 1-80 for each single bet. The machine generates 20 random numbers and you win if they match the ones you pick up. The big difference is the 20th number that the machine generates. It is the superball and the number it contains carries special bonus payout. If you can predict or strike luck with the 20th number, you win a jackpot of 4 times the normal win amount. The interface is both stimulating and balanced. The main keno board takes a major portion of the screen. The control panel is on the left-hand side of the screen and consists of a bet increase/decrease tabs, a quick pick tab and a wipe card tab. You can change your bet between $1 to $5 and it is shown just above the Bet tabs. Apart from clickable tabs, there are three digital indicators; your bank balance, your bet amount and your win details. Underneath the digital indicators is the Max Bet button, which sets the bet on to the maximum value. At the very bottom of the left side is the Play Game button which starts the keno game. A series of 20 balls, each with a number, rolls down a pipe and falls down on a space separating the board and the control panel. The 20th ball falls last and carries the jackpot number. The board itself is color coded with 80 green blocks. The numbers you choose are marked red and each time you hit a match the block turns yellow. Rest of your choices are marked purple. The overall graphic design is pretty self-explanatory and simple. There is also accompanying music with each match that you get. 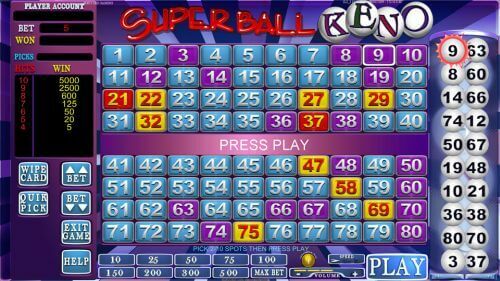 Superball keno offers a lot of fun and you can expect to make some basic returns if you play logically. Though the machine is random, you can increase your chances of winning by taking an optimized number of bets. A risky player will naturally go for quick money and go for the maximum number of spots and bet with 10 numbers. This may seem to be the best strategy to maximize your chances by maximizing your bets, but it proves unprofitable in the long run. Conversely, taking small bets of one or two shots is also not a good strategy, as if it hard to predict 2 numbers from a list of 80. The best way is to go long and play with 5-7 fixed numbers. The golden rule is that the machine will churn out all 80 numbers in equal probability, so stick to your set of numbers. Keep those numbers as your default value and engage in small bets. You have the option of saving up to 10 numbers as your lucky numbers, and every time you click on Play Game, the bet is locked on those fixed numbers. SuperBall Keno offers you smooth gameplay and instant fun. If you are an avid follower of Keno, this game will surely be your new addiction. Superball Keno is a video Keno produced by SED, also formally known as Vision Gaming. Superball Keno is a favorite for many Keno players for good reasons. In this article, we will explore a few of those reasons and more. One of the most enticing reasons to play Superball Keno is because it gives you the opportunity to win big. Like any Keno game, you will have to pick numbers that you think will win. With Superball Keno, the choices will range from 1 to 80. As the name suggests, Superball Keno has a feature known as the “superball,” which is the last ball that is going to be dropped in one betting cycle. The “superball” has a multiplier effect. Specifically, it will multiply your winning by four times. For example, if your chosen number spots would normally pay you $50 if you win, with the superball as part of the combination, you will get paid $200 instead. Superball Keno features a simple and straightforward visual theme. The board mimics the look of a real Keno board. Game statistics is to the right portion of the screen. Superball Keno is also easy on the eyes as it features a lot gray and white shades, which is less straining and good if you want to sit down and play for extended periods of time. Superball Keno features what it calls “Keno Spots,” but it’s just a name of the Keno numbers chosen by the player. Players have a wide variety when it comes to their “Keno spots.” You can either choose to spot bet a single number or a choose a combination of numbers that you hope will win. Keep in mind that like many most Keno games, you will have to do a bit of personal balancing between odds and payout. The fewer numbers you choose, the higher your odds of hitting. On the downside, the payout won’t be that big compared to spotting a lot of numbers. On the other side of the extreme, Powerball Keno allows you to spot 20 numbers and the payout is huge. The caveat is that the odds are abysmal. It’s up to you find the balance between payout vs. higher odds of winning. Although it’s best that you pick at least 7 numbers as it’s the minimum to hit the progressive jackpot. After you have placed your bets, you can press the “play” button. Then, the first ten balls will drop, and a brief pause will follow. During the pause, the game offers you the option of raising the bet by pressing “raise bet.” If you don’t want to raise, then you can press “keep bet, ” and the next ten balls will be dropped. Don’t forget, the last ball will be the superball. Superball Keno has the elements of a great Keno game. The mechanics are simple and straightforward so newcomers can easily grasp the game. It also features multiplier bonus which is the “Superball.” Plus, it also features a progressive jackpot. The last two features are attractive to the experienced players. It’s uncomplicated and pays big, no wonder it’s one of the most popular Keno games around.